Slotland’s progressive jackpot is won so often it's almost not even news. Still, I can't resist telling you about their latest winner! This time it was a thirty-something Canadian IT professional who $169,072 playing the instant-play casino’s Tikal Treasure slot game. Since the casino’s progressive is hit four or five times a year Eric J. joins a long list of jackpot winners. The latest winner had been grinding away for a few hours that night, winning a little here and there, enough to keep it interesting, but nothing to get too excited about. Fortunately, he had several wins over $1000 that kept him playing until he suddenly hit the jackpot. One reason Slotland’s jackpot is hit so frequently is that most of the casino’s real-money online slots are tied to one progressive jackpot. This is the first time the jackpot has been won by a player playing Tikal Treasure. The biggest ever was the American dad that won $266,800 playing Carnival last spring. The first mobile jackpot winner won $159,357 earlier this year playing the popular Ice Queen slot on his iPhone. Tikal Treasure takes players to the mystical temples of the ancient Mayans where the treasures of the ancients lay waiting. It’s a 5 reel, 25 pay line slot machine with eye-popping full screen graphics and brilliant sound effects. Ornate symbols from Mayan astrology, stone masks, sun gods and mystical Mayan cats spin on the reels. Collecting five stone Balls triggers the Bonus Round, a separate game that awards generous bonus wins. 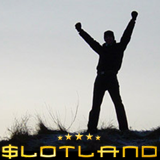 You won't find any of Slotland’s 32 games anywhere but Slotland.eu. All of them can be played in the browser on any computer, laptop, tablet or smart phone and the newest games are specially enhanced iPhone and Android phones.